From time to time, we like to feature stories from our sister publications around the world. The following is from the Manchester Mumbler in the United Kingdom. Though the United Kingdom’s exit from the European Union has been delayed until April, there are still issues that need to be addressed. This article has been translated into American English. 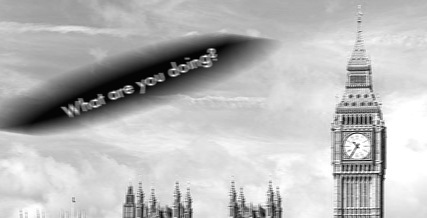 Enhanced photo of a UFO following the Brexit vote. Is Prime Minister May planning an invasion of Ireland? No one from the British Government would comment for this article. If Brexit leads to food shortages, interstellar charities will be barred from providing relief aid to the United Kingdom. She also confirmed that Virgin Interstellar, which currently manages all the UFO Bases in the UK, would be shut down after a no-deal Brexit. No one from the government would comment for this story. Ghosts could go deaf and the Loch Ness Monster could go extinct, according to the British Society of Paranormal and Zoological Researchers. A spokesperson for the British government asked to never be contacted by the Mumbler again. Note: All spellings have been converted to US English. 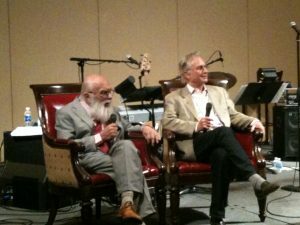 File photo of Richard Dawkins and James Randi from TAM 8. Oh, pipe down you silly person. Yes, you might lose your right to choose an abortion. Too bad your children might have to face the abuse of learning creationism in school. Quit your whining about gay rights. They probably don’t need them anyway. Stop complaining about the climate. Learn to swim, wear sunscreen, and think of famine as an opportunity to lose weight! It’s not so bad that you’re stuck inside a hard border. You also shouldn’t complain that your NHS money will be going to some unstable backwater of the British Empire. The biggest concern is that a woman who calls herself Prime Minister needs to form a majority in Parliament. She lost her majority because she just had to call an early election. Isn’t that terrible? So grow some thick skin and stop whining! At least you aren’t suffering under a Labour government! Many of the sources say May did not respond well to the letter. Dawkins and May could not be reached for comment. A spokesperson for the Center for Inquiry neither confirmed or denied that the letter was authentic. No one from the DUP could be reached for comment. Note: From time to time, the Babbler features articles from our sister publications around the world. This article comes from the Manchester Mumbler, which serves the Greater Manchester, UK area. We have translated this article into American English. Virgin Group founder Richard Branson, wearing a bow tie, sports jacket, and jeans, signed the contract formally transferring the bases. The UFO bases will be now be managed by Virgin Galactic. Neither Branson nor May would disclose how much the Virgin Group bought the bases for, or if they would pay taxes on them. Branson hoped the money would go towards the National Health Service. 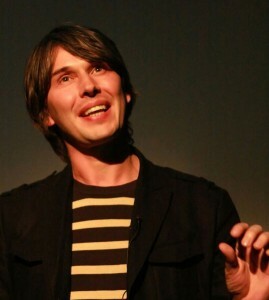 Photo of Brian Cox by Paul Clarke. Note: The Bolingbrook Babbler sometimes shares stories from its many sister publications around the world. The following article is from the Manchester Mumbler, located in Manchester, UK. This article was translated into American English. Great Britain’s ghosts continued their mass protests and riots days after physicist Brian Cox said the Large Hadron Collider “proved” they don’t exist. Cox, on his show the Infinite Monkey Cage, stated that the measurements and discoveries made using the Large Hadron Collider left no room for the existence of ghosts or for an afterlife. I would say that if there’s some kind of substance that’s driving our bodies, making arms move and legs move, then it must interact with the particles out of which our bodies are made. Since we’ve made high precision measurements of the ways that particles interact, my assertion is there can be no such thing as an energy source that’s driving our bodies. The violent reaction from ghosts was so great that its effects could be felt in our world. Chauncey urges all British residents to avoid all haunted places until the ghosts settle down. Page Three Sheep returns! Again!